Academic Staff Union of Polytechnics (ASUP), Kaduna Polytechnic Branch has warned President Mohammadu Buhari against reappointment of Dr. Muhammed Bello Ibrahim as Rector of the Polytechnic, threatened to shut down the school if reappointed. The Union expressed worry over the level of academic and infrastructural decadence in the institution within the four years of the rector, quickly added that reappointing him would be tantamount to another four years of disaster for the students and staff of the institution. 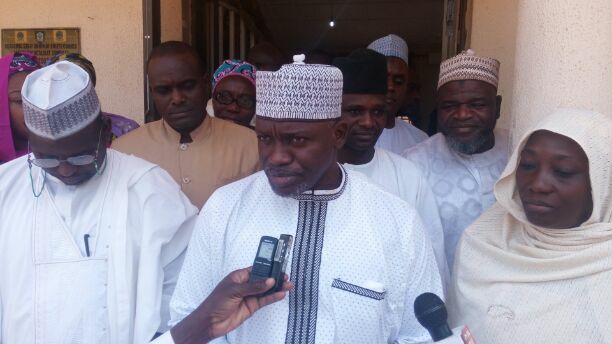 Addressing newsmen at unions building in Kaduna on Friday, the branch Chairman, Dr. Aliyu Hassan Ibrahim said, the call on President Mohammadu Buhari and Minister of Education, Mallam Adamu Adamu became necessary in order not to make the same mistake the federal government made four years ago by appointed someone who saw his office who did not have what it takes to manage the largest polytechnic in Sub-Sahara Africa effectively. What he described as high level of decadence in the institution was basically as a result of pure corruption, mismanagement, misappropriation of funds and connivance with bootlickers and sycophants, determined to kill the system at all cost, based on which he suggested the education minister should call for vacancy advertisement instead of reappointing Dr. Ibrahim for the second term. The union leader further stated that, “December 2015 salary was paid in 4 installments of 24.9%, 25.1%, 25% and 25% respectively over a period of two months N67m of December 2015 salary is yet to be fully paid in terms of cooperative deductions, tax remittances, church and mosques deductions, etc. ”Diversion of N36m TETFUND construction fund to other charges making it impossible to pay-off contractors after 5 months of project completion, investing over N900m for the upgrading of Applied Science laboratory which visually cannot be substantiated, for example Procurement of Equipment for Borosilicate Turbing machine for the Department of Applied Science CST (Lot B2) under 2011/2012 TETFund Normal Intervention of N18, 010, 628.97 paid on the 25th August, 2016 (a day to his official exit). “The money was paid to SSECCONN LTD at exactly 5.54pm through Zenith bank with account No. 1011471553 via remita STP, Batch number 426. “Illegally operating the account of the institution from 27th August till 18th October, 2016 with transaction to the tune of N1.091b (through GIFMIS and REMITAS) which mostly are made through personnel cost and SMKMC bills. “Transferring of excess personnel cost to other charges to pay contractors (gross misappropriation of fund). Presently the accreditations of over 18 courses have expired since January 2016. Expending over N87m on a flop convocation that was not attended by graduating students. “A leader that is insensitive to the plight of his staff in terms of payment of allowances, promotion implementation/arrears and the squandering of over N700m internal generated revenue (IGR) on yearly basis”, he added. He queried why a TETFUND merged intervention project (Department of Environmental Science), which has been completed for the past two years could not be furnished with only N5m out of the over N700m generated as IGR annually, thereby leaving the structure abandoned to the caprices of rodents and weeds. He added that, “we need a Rector that is selfless, transparent, dedicated, patriotic and nationalistic to the vision and mission of Kaduna Polytechnic and obviously all these qualities are lacking in the person of the former Rector. We shall reject anyone who will not propagate the vision of our dear institution in positive light as enjoyed during the tenure of Mallam Hamman Tukur and Dr. A.T. Abdullahi”. “We want you to bear witness that in the interest of industrial peace we are calling on the President Muhammadu Buhari, the Hon. Minister of Education, Mallam Adamu Adamu and all other stakeholders not to make the mistake of re-appointing Dr. M. B. Ibrahim because we will contest such move and the industrial peace presently enjoyed in Kaduna Polytechnic WILL NOT be guarantee if he is re-appointed”.